Education comes first at college, with goals of broadening horizons, developing critical-thinking skills, pursuing interests and earning a degree to launch a career. A successful college career calls for more, such as an active environment; chances to connect with peers, professors and professionals; opportunities to lead and serve. 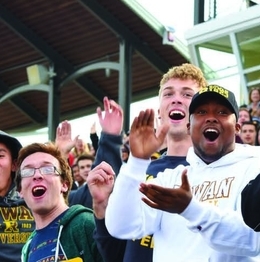 Rowan students are committed to contributing to campus and community. The Student Government Association is an example of that dedication. SGA members are the voice of the students and liaisons to the administration, ensuring that their peers’ concerns are heard and needs are met; work with faculty, staff and administrators; promote involvement in campus and community activities; and contribute to the university of today and tomorrow. There is something for everyone at Rowan. Interested in writing? Sign up for the school newspaper. Want to network? Virtually every major offers special interest groups. Is Greek life important? The university is home to numerous fraternities and sororities, all with service requirements. The range is wide here—there are organizations for students of various ethnicities, religions and gender identities; sports groups, such as Rowan Unified, which brings together college students and young people with disabilities; and pre-professional societies that help prepare students for medical and other fields. It’s not your father or mother’s Rowan. If you haven’t been here recently, you’re missing a lot. Today, thanks to the $400 million Rowan Boulevard public-private partnership, the area just off campus is alive with festivities and home to retail outlets, restaurants, housing, classroom and office space, medical centers, a Barnes & Noble, a Courtyard by Marriot and more—a bustling bridge between Rowan and downtown Glassboro. The spirit is as strong at Rowan as at any Big Ten school, with students, faculty and staff, alumni and friends cheering on our Profs. Rowan offers seven major Division III teams for men and nine for women, from football to volleyball to swimming. We pride ourselves on cultivating student-athletes committed to their studies and teams. Those student-athletes are winners off and on the field, maintaining high academic averages in diverse majors and earning team and individual awards in their sports. People study, work, socialize and volunteer best when they feel safe. Rowan students live and learn on a campus that the National Council for Home Safety and Security has named one of the top 100 safest college campuses in the United States. The council ranked Rowan 58th on the list, which includes institutions with enrollment of 10,000 or more students. The ranking was compiled using the most recent data from the FBI’s Uniform Crime Reporting Program and the Campus Safety & Security Survey distributed by the U.S. Department of Education.